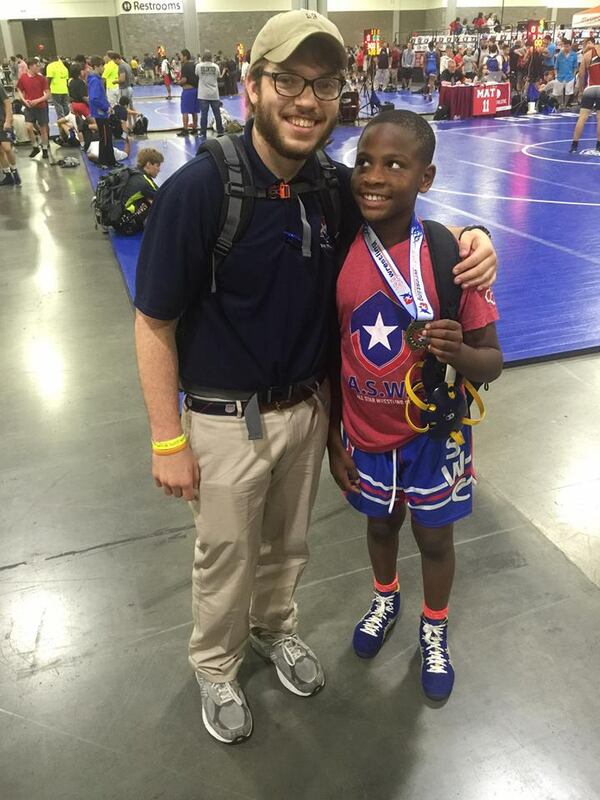 The last two weekends of May were very busy ones for Louisiana wrestlers. 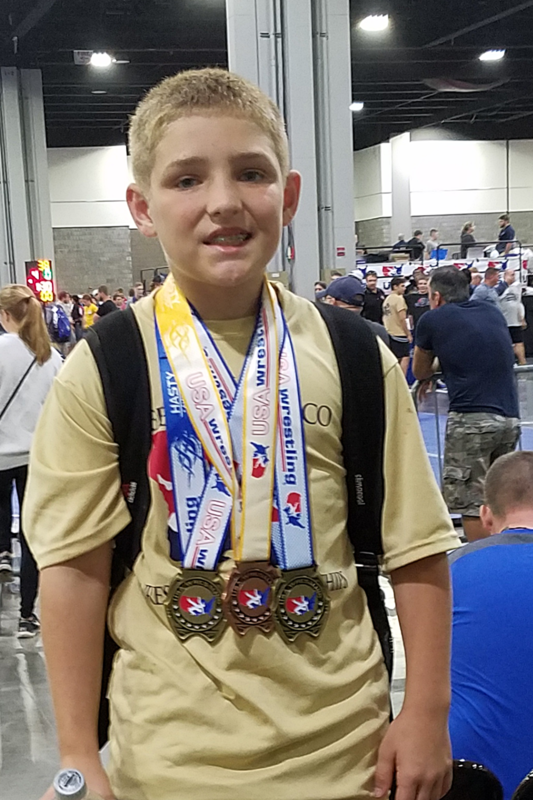 Several girls (and with them, Jake Rando), participated in national events in Irving, Texas, from May 20th-22nd, and a large group of wrestlers went to Atlanta for the USAW Southeast Regionals from May 27th-29th. Nine Louisiana young women participated in the 2016 Body Bar Women's Nationals held through at the Irving Convention Center on May 20th-22nd in Irving, Texas. The Ascension Wrestling Club brought six members: Briana Arauyo-Batista, Roslyn White, Ashlyn Bennett, Hollis Burton, Kimo Hickman and Lilia Rangel. The Lafayette Scrappers were represented by Raven Guidry and the Gator Wrestling Club (River Parish) by Abigail Nette. Brittany Bates represented her own club, HoustonBrittany, but with her national competition resume, she can do that! For most of the young ladies the event was a learning experience, although several notched victories, including three who won twice. Roselyn White and Ashlyn Bennett both sported 2-2 records and finished in fourth-place. Miss Nette won her first two matches before losing in the quarterfinals and in her first consolation round match. Miss Bates lost in the first round but scored a quick pin in her first consolation match. Bates lost her next match, but had she won she would have faced Nette. As things worked out, though, the same young lady who defeated Miss Bates also defeated Miss Nette. 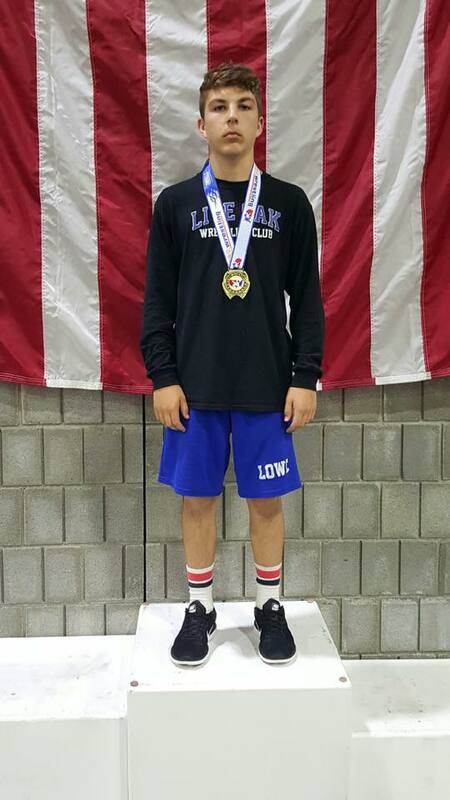 Jake Rando, the two-time Division I state champion from Holy Cross, qualified for the United World Wrestling (UWW) Freestyle World Team Trials, also held at the Irving Convention Center on May 20th-22nd. Rando went 0-2 on the day, but while his first match was a 10-0 TF loss to the eventual runner-up from Missouri, his next match was a very close 17-14 affair. Louisiana coaches brought over 60 of their grapplers, ranging in age from 8 to 18 years-of-age, and weighing between 40-225 lbs., to the USAW Southeast Regionals at the World Congress Center in Atlanta, Georgia. The younger grapplers in Bantam, Intermediate, Novice and Schoolboy categories, started off on Saturday, May 28th, in folkstyle competition. Later on Saturday they were joined by the Cadet and Junior Men in the Greco-Roman competition, as well as the Junior Girls in freestyle. On Sunday the freestyle competition was held for all age groups. Louisiana only had one female competitor and Live Oak's Kharma Culpepper did not disappoint as she notched two wins in her three matches to place as the runner-up in the Schoolgirl Freestyle competition. After a first match loss to the eventual champion from Georgia, Miss Culpepper scored a 10-0 technical fall over a South Carolina opponent and then pinned another Georgian in 1:32 to place second. Miss Culpepper also participated in the Schoolboy competition, notching a quarterfinals fall in 3:09 before losing to the eventual runner-up and then the girl she lost to in the freestyle competition, who placed fourth. Louisiana netted four folkstyle champions on Saturday. Dominick Durham went 2-0 to win the Bantam 60 lbs. weight class, as did Ethan Herring to win the Intermediate 103-112 lbs. title. In the Schoolboy 77-84 lbs. competition, Evan Frost went 4-0, scoring three falls and a major decision in a 10-person round-robin format. 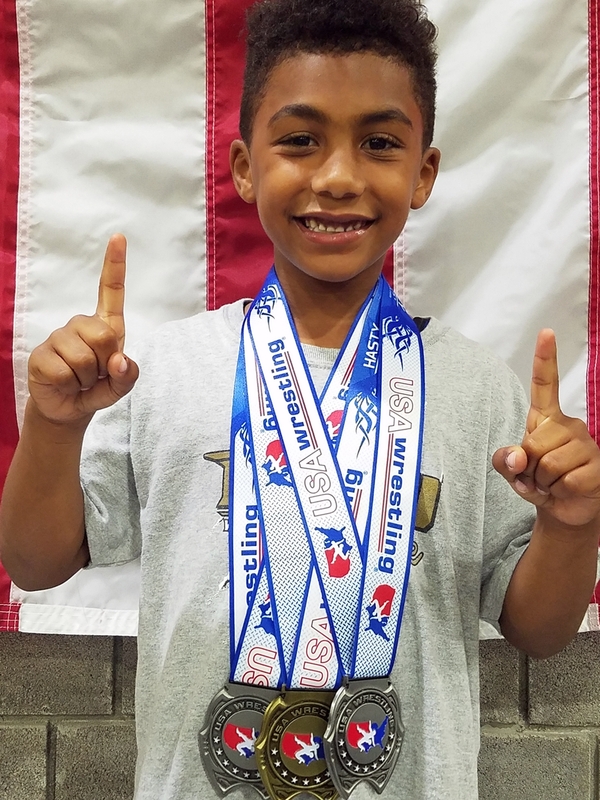 Peyton Ward won three matches in a nine-person event to win the Schoolboy 98 lbs. division. Kharma Culpepper, Jack Graham and Avery Verret did not place in their weight classes, but each tasted victory by winning one of their matches. The Greco-Roman events recognized six place winners per age group and weight. Taking home championships were Nicholas DiGerolamo (2-0 at Intermediate 87-95 lbs. ), John Drake (3-0 at Schoolboy 210-225 lbs. ), and Anthony Dodson (4-0 at Schoolboy 128 lbs. with three falls and a 13-2 technical fall in the finals). Ethan Christoffer sported a 1-2 record to place second at Intermediate 76 lbs., as did Dominic Durham in the Bantam 60 lbs. class. Jared Thieler posted a 3-1 record to place second in the Cadet 126 lbs. group. Dominic Durham and Camdyn Ingram placed third in their classes, while Kael David and Kye Karcher placed fourth. Fifth-place winners were Grant Hughes and Dane Harter, while placing 6th were Clayton Hill, Evan Frost, Jack Graham and Jacob Frost. 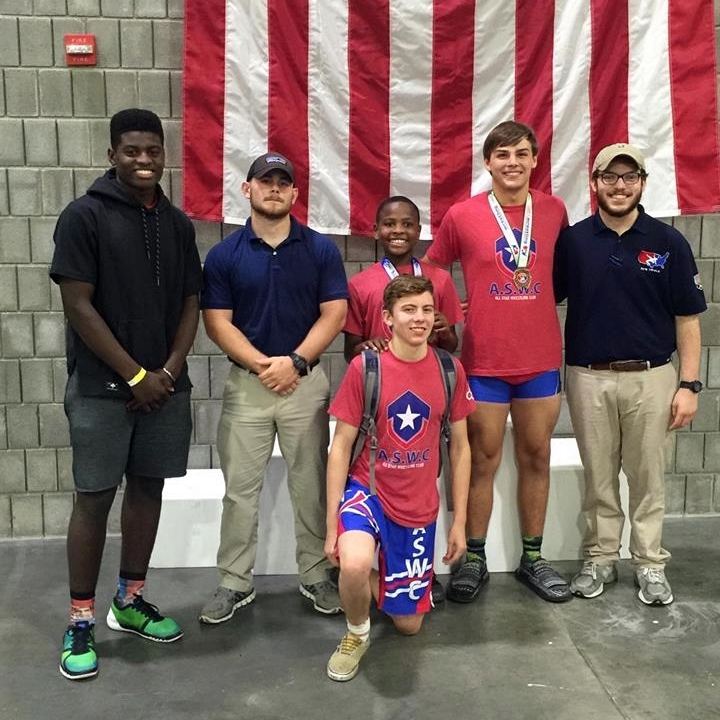 Five Louisiana wrestlers won two matches but did not place. They were Christian Satchell, Cole Houser, Mason Middleton, Joshua Bell and Michael Benton. Scoring one victory apiece but not placing were Brandon Stein, Cameron Frost, Eric Trahan, Shane Ulfers and Jacob Ramirez. GRECO-ROMAN JUNIOR MEN at 113, 152 and 170 lbs. These groups are treated separately as they included five LHSAA state champions. At 113 lbs. Rummel's Division II state champion Blake Mateu lost to the eventual runner-up in the semifinals, but once before that and twice afterward won via technical falls to place third. The 170 lbs. included Brandon Turner, the Division III state champion from South Plaquemines, Josh Ramirez, the Division II state champion from Rummel, and Joey Foret, the Division I state champion from Holy Cross. Turner, participating in his first national competition, went 0-2, but Ramirez and Foret both made it to the semifinals on opposite sides of the bracket, which made the weight class very interesting for Louisiana fans. Ramirez lost 12-2 to Jack Jessen of Illinois, but won his next two match to place third. Foret, who, unlike Ramirez, did not have a first round bye, advanced to the finals with an 8-5 win over Jeffrey Lanham of Ohio. Foret, however, lost his finals match to Jessen by a 10-0 score. Hence, Foret and Ramirez each posted records of 4-1 and each lost to the same opponent by 10 points. The toughest weight class of the tournament must have been Jake Rando's 152 lbs. The first name the editor recognized, aside from "Steve Rando? ", was Antonio Artalona of Florida. Artalona defeated Rando 13-2 at the 2015 South Walton Border Wars, en route to a championship and Outstanding Wrestler award. Luckily, the editor thought, Artalona was in the top half of the bracket while Rando was in the bottom half. If Rando, however, were to make it to the finals, Artalona would have to get past his quarterfinals against a kid named Brands from Iowa. "That rang a bell" with the editor, and after a little research it was learned that Nelson Brands was the son of the University of Iowa assistant coach Terry Brands and nephew of the Hawkeye's head coach Tom Brands. The editor was correct to note that as Brands beat Artalona via a 16-6 technical fall, and then advanced to the finals with a 12-2 technical fall. Meanwhile, back in the bottom part of the bracket, Rando lost his quarterfinals match 10-0 to a Lenny Merkins of New York. Merkins then won another 10-0 technical fall to reach the finals against Brands. In the consolation rounds Rando won a very close 12-10 match to advance to the consolation quarterfinals. He won that match 14-8 and then advanced to the consolation finals with a 13-11 win. On the other side of the consolation bracket, though, Artalona won via a disqualification and two 10 technical falls to make the consolation finals. There he defeated Rando 7-0, but placing fourth with a 5-2 record against the likes of that competition is very impressive. Oh, and as for that kid from Iowa in the finals? Well, Merkins, the New York wrestler whose quarterfinal win knocked Rando into the consolation bracket, pinned Brands in 1:44 to win the championship. Louisiana won four more gold medals in the freestyle competition. Nicholas DiGerolamo went 2-0 to win the Intermediate 87 lbs. class and Ethan Herring posted the same record to win the Intermediate 103 lbs. class. In the Schoolboy competition, Camdyn Ingram went 4-0 to win at 112 lbs. and John Drake posted a 3-0 record to win at 210 lbs. Two Bantam and one Schoolboy wrestler took second place honors. 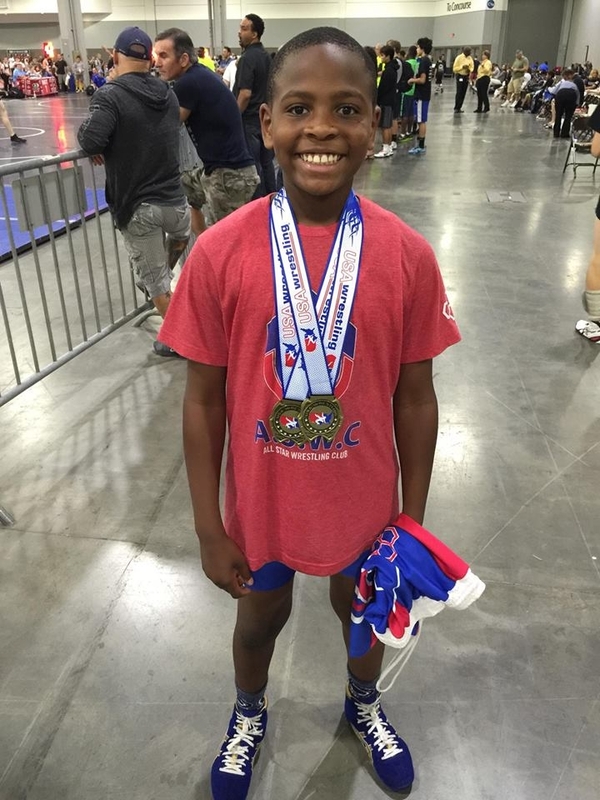 Dominick Durham went 2-1 in the Bantam 60 lbs. competition, and Ethan Christoffer did the same at 75 lbs. In the Schoolboy 98 lbs. event, Peyton Ward posted a 3-1 record to place second. Losing only one match out of four and placing third were Landry Barker in the Novice 95 lbs. class and Dane Harter in the Cadet 195 lbs. event. Seven wrestlers placed fourth. In the Bantam class they were Kael Davis (50 lbs. ), Nico DeSalvo (55 lbs.) and Jace Golson (60 lbs.). Cadets placing fourth were Brandon Stein (113 lbs. ), Jared Thieler (126 lbs.) and Grant Hughes (145 lbs.) Rhett Barker place fourth in the Schoolboy 136 lbs. event. Placing fifth were Cadet Thomas Arceneaux at 182 lbs., Intermediates Kye Karcher (55 lbs.) and William Edmonston (75 lbs. ), and Schoolboy Anthony Dodson (128 lbs.). Cadet Jake Whelan placed sixth at 195 lbs. as did Novice Andrew Lusby at 95 lbs. and schoolboys Evan Frost (84 lbs.) and Wyatt Coffey (128 lbs.). Of those who did not place, Joshua Bell won three matches in the Junior Men 138 lbs. class. Michael Benton won two matches in the Junior Men 182 lbs. class and Cadet Dylan Hezeau won two matches in the Cadet 145 lbs. competition. Others getting a taste of victory were Cadets Connor Oviedo (113 lbs. ), Christian Satchell (133 lbs. ), Mason Macaluso (132 lbs.) and Hayden Henley (138 lbs. ), Schoolboys Jack Graham (112 lbs. ), Jordan Griffin (120 lbs.) and Nawab Singh (128 lbs.). Mason Middleton also won a match in the Junior Men 126 lbs. event. FREESTYLE JUNIOR MEN at 113, 152 and 170 lbs. 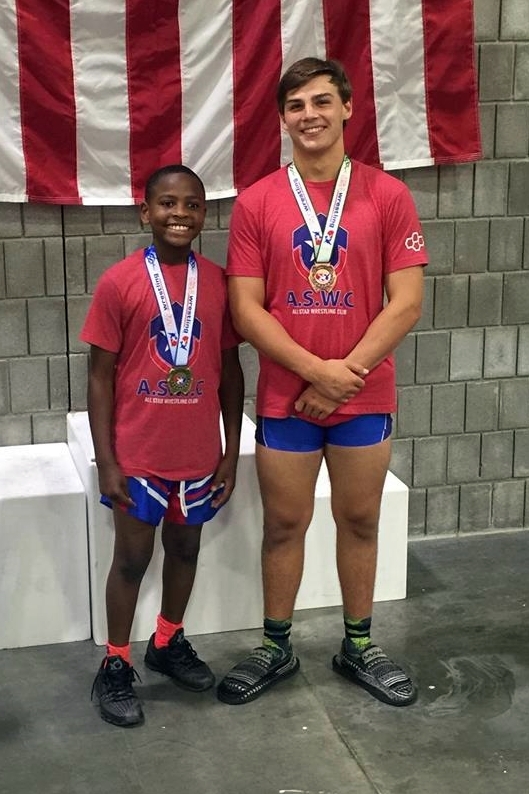 Rummel state champion Blake Mateu, who placed third in the Junior Men Greco-Roman competition, moved up a place to runner-up in the Freestyle tournament, posting a 2-1 record at 113 lbs. Jake Rando, at 152 lbs., again had a ridiculous weight class. This time Anthony Artalona was in his side of the bracket, but Rando defeated him via an injury forfeit (the extent of which is as yet unknown). In the semifinals Rando fell to James Noel, one of only six wrestlers representing the state of Arkansas in the event. In the finals, the Brands kid from Iowa avenged his Greco-Roman finals loss to New York's Lenny Merkins via a 12-11 second round win, and Brand easily reached the finals and defeated Noel 13-3. Rando, starting the consolation round in the semifinals, fell to Merkins again, and according to his father, he and Anthony Silva of Illinois were not allowed to wrestle the match to decide 5th-place. The bracket at 170 lbs. was again very entertaining, except for South Plaquemine's Brandon Turner, perhaps, who ran afoul of the Greco-Roman champion from the day before, Jack Jensen of Illinois, in the first round. Turner fell in his first consolation match, but one should remember this was only the second time Turner participated in an out-of-state USA Wrestling event. Joey Foret and Josh Ramirez found themselves both in the bottom half of the bracket, but a meeting between the two would have to wait as Ramirez lost to eventual winner Cameron Caffey of Illinois, and Foret then lost to Caffey in the semifinals. Foret squeaked into the consolation finals with a 4-2 win over Tennessee's Matthew Sells (whom Foret defeated 10-6 in the quarterfinals). Ramirez, however, had to win three matches to meet Foret in the consolation finals. In the first of what may be a few meetings between the Holy Cross senior and the Rummel junior, Ramirez won 4-2 to place third.